My first visit to Banana Leaf! I think I expected it to be something like Tropika. Not that I’ve been to Tropika many times either. Instead of going to Benkei for ramen we randomly ended up here since we had no idea where the 99 B line stop near Benkei was. The decor and atmosphere here was quite nice with attempts to look exotic judging by the fake plants, dark green walls, and fake parrots. Since we were in a hurry, I quickly chose something from the lunch special menu, Nasi Goreng, Malaysian style fried rice for $8. All the lunch special items were between $8-$14. I also saw the same dish on the regular menu for $11 so maybe the portion for the lunch menu was smaller? The food came pretty quickly and it was good! Probably because it had a lot of sauce on it and I like sauce! It was a sweet sauce, can’t really describe it… something along the lines of that thai sweet chilli sauce with pineapple or something? 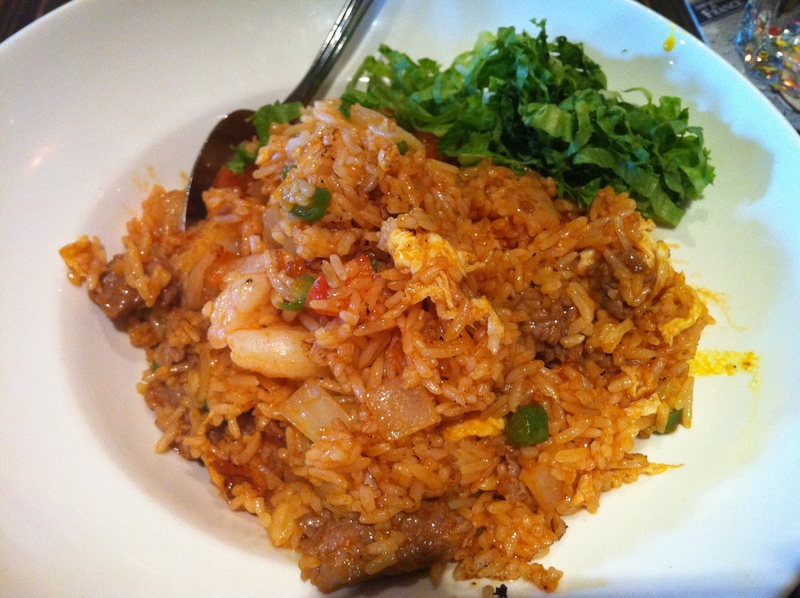 The fried rice had some shrimp, beef, tomato, green onions and egg. The portion size was typical for $8 and filling enough for me. I think I’ll come back and try other menu items sometime. I feel like trying a lot of other restaurants on Broadway now! This entry was posted in Food Reviews, Malaysian and tagged banana leaf, fried rice.